OAKLAND, CA (USA) — August 29, 400 people came together at First Congregational Church, by the shores of Lake Merritt, to commune with the wisdom and compassion of two senior luminaries of engaged Buddhism, Ajahn Sulak Sivaraksa and Joanna Macy. 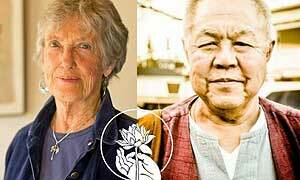 << Eco-philosopher Joanna Macy and INEB founder Ajahn Sulak Sivaraksa were the keynote speakers at the national gathering of Buddhist Peace Fellowship (BPF). The multi-generational audience was a mix of the kind of people who’d stop on a freeway and help you get your car running: extraordinary, ordinary people, from across the US. The event inaugurated a weekend-long national gathering of Buddhist Peace Fellowship (BPF). Celebrating its 25th year, the fellowship’s mission is to serve as a catalyst for socially engaged Buddhism. Its purpose is to help beings liberate themselves from the suffering that manifests in individuals, relationships, institutions, and social systems. Eco-philosopher Joanna Macy, PhD, is a scholar of Buddhism, general systems theory, and deep ecology. A respected voice in the movements for peace, justice, and ecology, she interweaves her scholarship with five decades of activism. She has created a ground-breaking theoretical framework for personal and social change, as well as a powerful workshop methodology for its application. Thai activist, and co-founder of theInternational Network of Engaged Buddhists (INEB), Ajahn Sulak Sivaraksa is a scholar, teacher, and renowned advocate for peace. These two keynote speakers were introduced by Soto Zen priest and folksinger, Hozan Alan Senauke, Executive Director of BPF from 1991 to 2001. Joanna Macy began by calling engaged spirituality “the work that reconnects.” Acknowledging this as taking place in cultures that have nurtured the Dharma, she extended the frame beyond Buddhism – because being truly human means to be in resonance with all life. Ajahn Sulak Sivaraksa agreed, noting the Buddha was not a “Buddhist,” nor was Jesus a “Christian.” This path of ethics, wisdom, and social action cuts across social and ethnic lines. That said, he emphasized a point fundamental to engaged Buddhist theory and practice: the Buddhist critique of the suffering self is applicable on more complex orders of organization, higher levels of scale. Social systems too manifest the inherent tendencies of the mind about which the Buddha preached, namely, fear, freed, and delusion (three poisons, at the root of needless suffering [dukkha]). Joanna Macy added her observation that the drums of war are beating. More people are suffering. Despair exists in alarming proportions. Against that, she sets the need to live in peace, recognizing our true nature as brother and sister. Buddhism is a living practice of non-separation. The Buddha’s teachings on pratityasamutpada dependent co-arising; dependent origination ; interbeing show us our reciprocal relationship to teach other, and to the natural world. When sidetracked and blinded by the three pollutants, we bring suffering on ourselves. She recounted a turning point in her personal understanding of this. When she and her husband were living in India, serving in the Peace Corps, in the 1960s, they worked with refugees from Tibet. Only after some time did she ask how was it they were able to keep their humanity intact. The answer, anatman (nonself), had never sounded attractive, as if it were some kind of void. But now it became clear. She saw the refugees in herself, and herself in the refugees. And this liberated her to immediate action – just as she was, without having to fabricate any “better” self to do so. Many in the the audience laughed when she warned against “premature equanimity.” Ego is what’s not to be attached to. The world is here to join with and work with us in our journey to find True Nature. Hers isn’t a sentimental feeling, either. Rather, it’s a result of Vipassana teaching us to notice our own emotions that come up when we study the world’s problems. Fear and rage are natural responses. Metta engenders karuma (compassion). Karuna arises when you realize people are suffering because of you. Then, when we share their suffering, with compassion, this gives rise to mudita(sympathetic joy). Mudita teaches us not to hate the oppressor. Then upekkha can arise, as a subtle, mature form of practice. From this grounding, we can oppose and overcome racism, sexism, and injustice. Thus can we confront such suffering (dukkha) mindfully, and trace its origins in the three poisons. Ajahn also counselled the gathering to “learn to be normal” – by applying sila (ethics). Otherwise we might succumb to the tendency to exploit self in the name of power, success, money. Letting go enables prajna (wisdom) to arise.